(orthochristian.com) - Only a handful of specialists now know about a liturgical rite called “the Furnace Act” practiced in Russia from the sixteenth to eighteenth centuries, and mentioned as early as the tenth century in Byzantium. It was a rite that was celebrated on the great feasts. With this rite also began the forefeast of the Nativity of Christ. 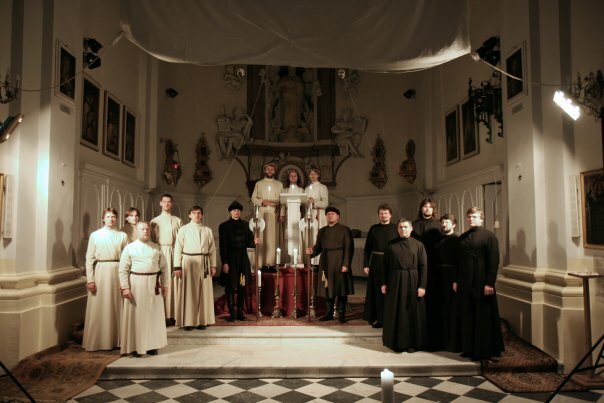 One of the musical-folklore specialists who has researched the “Furnace Act” is Andrei Kotov, creator and conductor of the Siren Choir—a marvelous Russian choir that performs ancient Russian religious music. “We searched a long time for it. At first we found a description of it in the Book of Rites of the Dormition Cathedral in the Moscow Kremlin (there are only two descriptions extant—in the Dormition Cathedrals of Moscow and Novgorod), and having found a detailed description, we started our search for the music,” recalls A. Kotov. “It took us nine years to gather a unified Furnace Act—we had to find all the music that went into it. Of course, many music theorists helped us… Our own Polina Terentieva, who sings in our group (she is our remarkable theoretician and singer) began an intense search, and found the “demestvo four-tones” and some amazing music for the Furnace Act.